If Zach Mettenberger continues to improve, LSU could be a top-10 team in 2013. Zach Mettenberger is back for his second year as a starter after a junior season that was ushered in with huge expectations — perhaps too big — and wavered between disappointing, mediocre and effective. He wound up with 2,609 passing yards, but only 12 touchdowns against seven interceptions. New offensive coordinator Cam Cameron has a reputation as a strong tutor of quarterbacks, and he could be a huge influence on Mettenberger in a season in which LSU needs its quarterback to be productive. In the backfield, Jeremy Hill exploded as a go-to back midway through his freshman campaign and led the Tigers with 755 rushing yards. However, he is facing a suspension after an arrest in late April after allegedly punching a man outside of a bar. Even though Hill will be missed, LSU, as usual, has other quality options in the backfield. Alfred Blue and Kenny Hilliard both spent time as the lead back last season. Receivers Odell Beckham Jr. and Jarvis Landry were special at times in 2012, but way too ordinary at others. They need to limit their drops and improve their route-running. Junior college transfer Quantavius Leslie could give LSU a home run threat. The Tigers go into the season with four veterans up front, augmented by a host of promising newcomers. The one major hole is at center, where Elliott Porter takes over for three-year starter P.J. Lonergan. The right side seems fairly locked down, with Trai Turner and Vadal Alexander back at guard and tackle, respectively. Guard Josh Williford's status is uncertain after a concussion suffered in fall camp. The rebuilding of the defense begins up front, although this isn’t exactly a starting-from-scratch project. In fact, the experienced players back — Jermauria Rasco, Anthony Johnson, Ego Ferguson and Danielle Hunter — may be more athletic and potentially more explosive in terms of generating a pass rush than the recently departed group. No player was more valuable to the LSU defense in 2012 than departed linebacker Kevin Minter, who more or less took away the middle of the field. A talented six-man 2012 linebacker recruiting class helps fill the gaps along with one of the state’s best prep players, Kendell Beckwith. Senior Lamin Barrow should also be an anchor after he played a strong second fiddle to Minter with 104 tackles. There will be some new faces in some prominent roles in the secondary. Cornerbacks Jalen Mills and Jalen Collins were forced into action as true freshmen last fall and showed flashes of a bright future. But both also have to get better across the board for the secondary to improve after a late-season fade cost the Tigers wins against Alabama and Clemson. The safety spots seem to be in good hands, with senior Craig Loston — if he can stay healthy — and junior Ronald Martin. Zach Mettenberger, QB – Showed signs of being an All-SEC-caliber quarterback at times and now has a new offensive coordinator to help him find consistency. Odell Beckham Jr., WR – The Tigers need Beckham to limit his drops and use his athleticism (16.6 ypc) to produce big plays. La’el Collins, OL – Gives the Tigers a veteran to plug in at left tackle or one to keep at left guard if a younger lineman emerges. Either way, he is the anchor up front. Lamin Barrow, LB – Overshadowed by Kevin Minter, but he was one of the stalwarts in a linebacker corps that helped camouflage some inexperience and youth in the secondary. 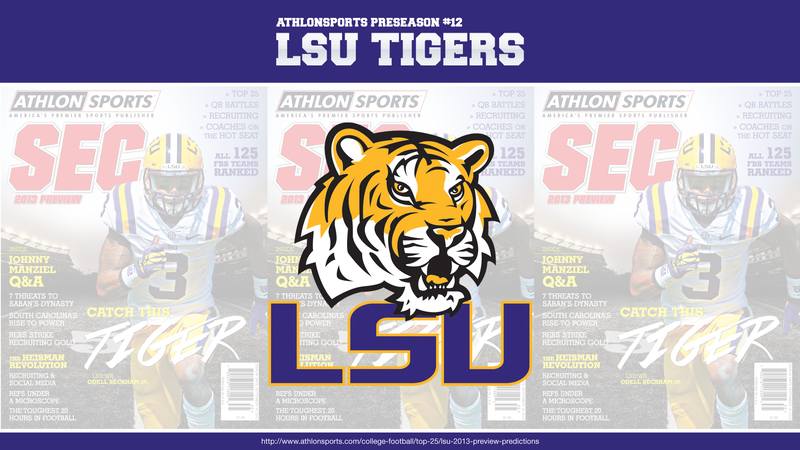 Anthony Johnson, DT – Blossomed as a sophomore as a run-stuffer and pass-rusher and comes back as LSU’s best and most experienced man on the front four. Yes, LSU even got stung by early departures in the kicking department when wacky but talented punter Brad Wing left for the NFL. But another strong-legged Australian, Jamie Keehn, showed his value in the bowl game when he averaged 44.6 yards per kick. The placekicking spot is up for grabs between junior James Hairston, who has kicked off the last few seasons, and walk-on Colby Delahoussaye. The Tigers were hit hard by early departures to the NFL, leaving only 10 starters returning in 2013. The cupboard isn’t bare for Les Miles, but the Tigers are behind Alabama and Texas A&M in the SEC West pecking order. LSU won’t abandon its run-first approach on offense, but Cameron, the new coordinator, is tasked with getting more production from Mettenberger. The defense has plenty of young talent and will get better as the season progresses. However, there will be an adjustment period with the departure of six key linemen, an All-SEC linebacker and two starters in the secondary. How many SEC games will LSU win in 2013?